If you’ve ever had to choose tiles for your bathroom walls then you’ll know all too well of the many, many and I mean many styles, colours, shapes and sizes available. Bathroom wall tiles not only vary widely by design but they also come in a huge range of prices. If you’re buying bathroom wall tiles on a budget then you’ll be happy to know that this does help narrow down some of the choice, but you’ll be happier to know that tiles under £15/m² don’t sacrifice quality or style. What is a bathroom wall tile? If you want to cover your bathroom walls with tiles then you’ll need bathroom wall tiles. 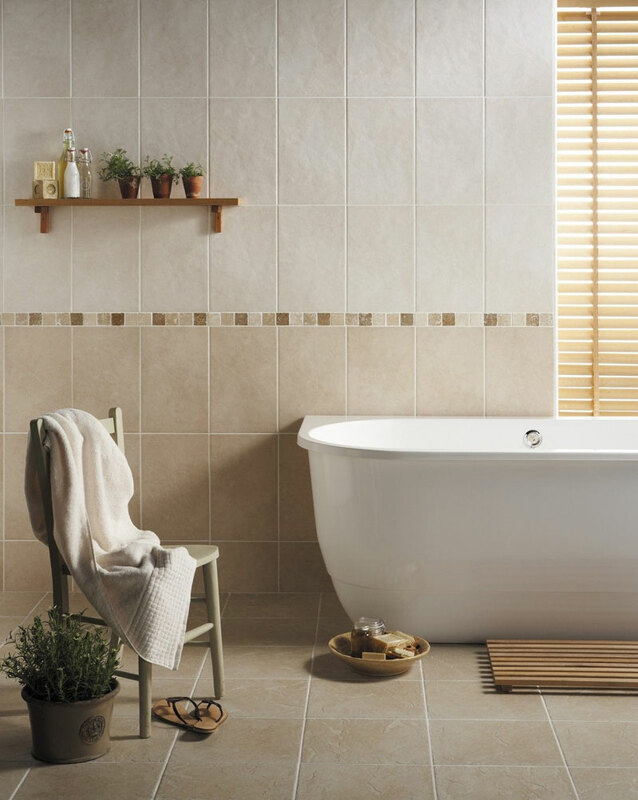 These tiles are specifically designed for bathroom walls and they’ll cope with the stresses of a damp, humid room. If you’re using tiles to decorate around a shower area or bath then, as long as your grouting is done properly, they will protect the tiles wall from water. Not all wall tiles are solely designed for bathrooms and you may find wall tiles that are suitable for other rooms in and around the home too. We’ve decided to use square meter prices rather than the box price in this guide because your job will inevitably include bathroom wall sizes in m². This way you can work out the cost of your bathroom tiles much more effectively as the box price will not give you any real indication of how many tiles you’ll need to complete the job. If you do need a wall tile calculator tool to help work out how many tiles you’ll need for your walls, this wall tile calculator will certainly come in handy. Although some tiles can cost well over £50/m² you’ll be pleased to know that finding bathroom wall tiles under £15/m² is a doddle. Here at VP, we’ve looked through lots of designs to handpick 5 wall tiles for bathrooms you can buy on a small budget. As always, these are in no particular order, but we’ll outline why we’ve chosen them and why we think you should consider them in your latest bathroom update. 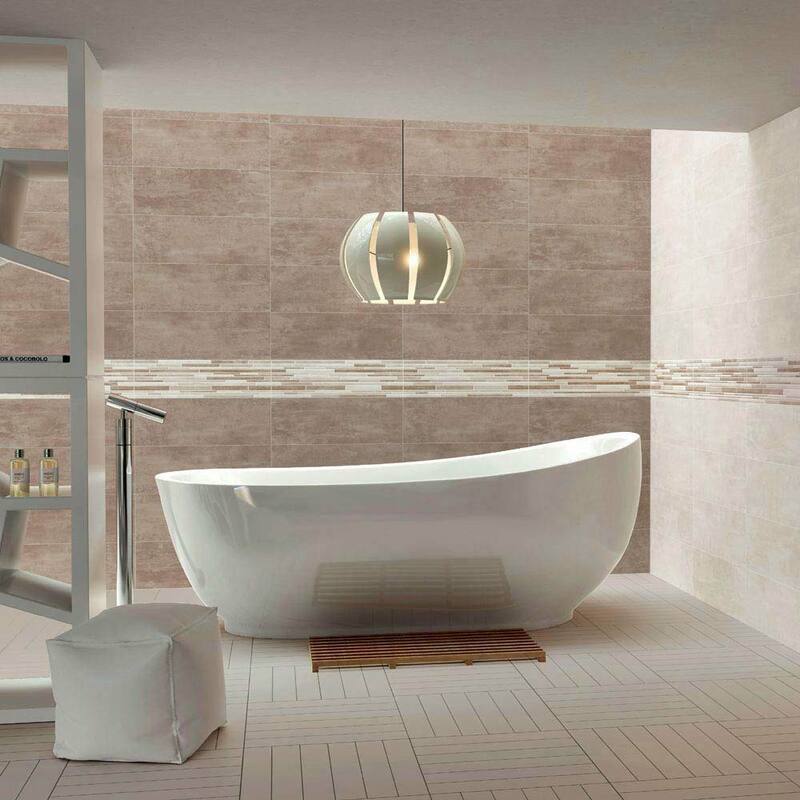 The Dolomite collection from RAK is an ultra luxury bathroom wall tile on a budget. RAK is the largest ceramic tile manufacturer in the world and you can be assured of the best quality. These large bathroom tiles have a rectangular shape and can be positioned in the traditional horizontal pattern or within an array of common tile patterns to suit. This Black Satin tile is made using high quality ceramics and is finished to perfection. What could you buy with the change? In order to stick these beautiful tiles to your bathroom wall, you will require some grout. The change from your budget may not pay for all of it but it will go some way towards the cost! The rustic white Buxton tile from BCT is perfect for creating a luxury feel for your bathroom wall. The soft satin look creates an elegant finish for this natural stone inspired tile. These wide set tiles are excellent for laying vertically in a ¾ brick bond pattern against your wall. British Ceramic Tile (BCT) has earned a reputation for quality tiles which means you’ll be getting the best tile for your budget. What could you buy with the change? Change from your budget should bag you some useful little tile spacers to help you get everything perfect! Travertine effect tiles are hugely popular in bathrooms right now making the Salerno Ivory wall tiles perfect if you’re on a budget. Why not take a look at border tiles for bathrooms to see if you can get creative? Made using excellent materials, these Italian styled tiles provide a warm, subtle look which is neutral in colour and will look stunning wherever they’re placed. What could you buy with the change? Finish the job like a pro by using the change from your budget to put towards some tiling tools and accessories! 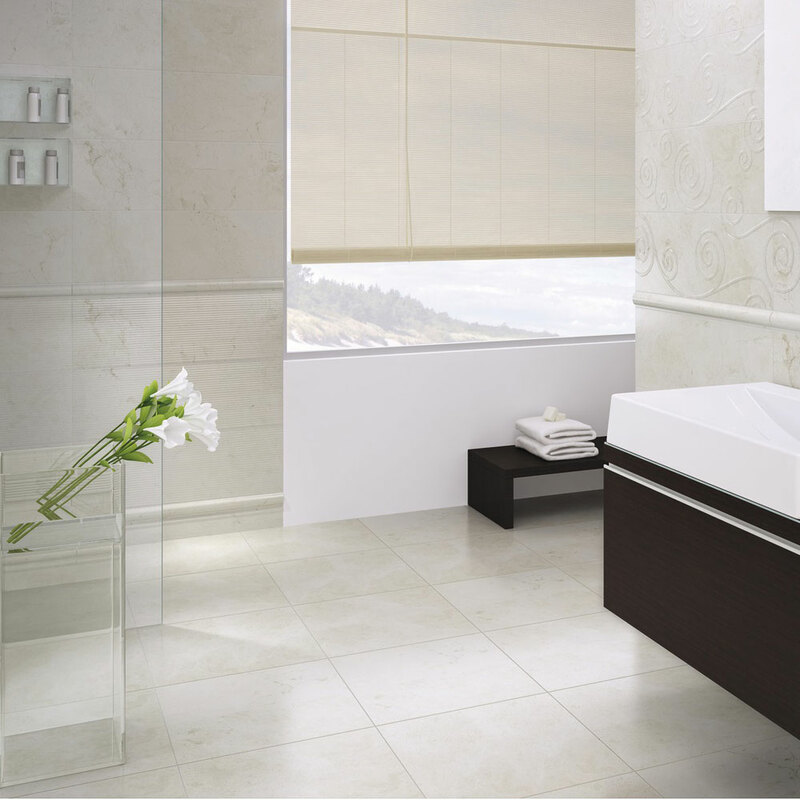 Cream bathroom wall tiles have been a top choice for both modern and traditional bathroom styles for years. The versatile neutral tones work perfectly with many other colours or just on its own. The Aragon cream wall tile is from our own Spanish inspired range which means you’ll get a top quality product without the top quality pricetag. Not only are they flexible in style but they can also be used in your hallway or as stylish kitchen tiles. What could you buy with the change? There’s plenty of change from your budget here which means you should be able to put your savings toward a Tiling Starter Kit to help you complete the job! Stone effect bathroom wall tiles are highly popular and the Duna wall tile is no exception to the rule. These beautiful white bathroom tiles have a long rectangular design - perfect for laying horizontally for a grand, opulent look. 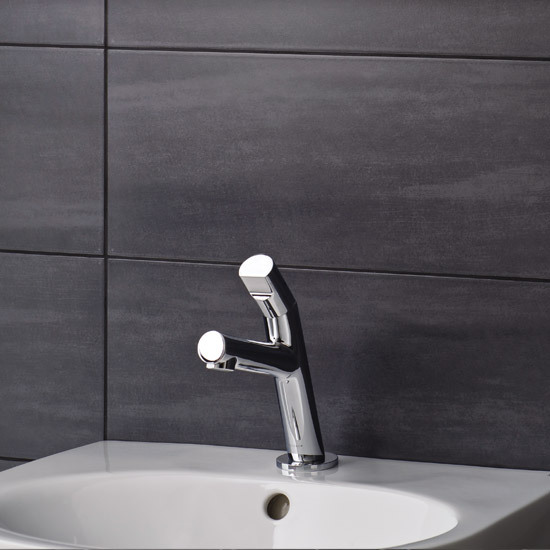 As part of our own range of bathroom tiles, you can ensure yourself the highest quality ceramics at lowest possible prices making them excellent for a £15/m² budget. What could you buy with the change? The Duna tile will give you the most change for your budget which means you could put the remaining money from your budget towards some neat little bathroom accessories! What will your bathroom wall tile budget do for you? With a budget of £15/m² for bathroom wall tiles, it’s easy to see that options are certainly not limited. Not only can you buy tiles for bathroom walls for £15/m² but some come in at much lower prices which leaves you with extra money to put towards all the other little bits and pieces you’ll require to finish the tiling project. This brings me onto my second point. If you are trying to stick to a budget when buying tiles for bathrooms, please ensure you factor in the cost of grout, tiling tools and spacers. You also need to allow for breakages. We recommend ordering 10% extra which should be adequate to complete most jobs, however some tiling patterns such as a diamond pattern may require 15-20% to allow for the little cuts and higher risk of breaks or errors. As we mentioned earlier bathroom border tiles can create a really nice effect on your wall so look around for inspirational ideas. 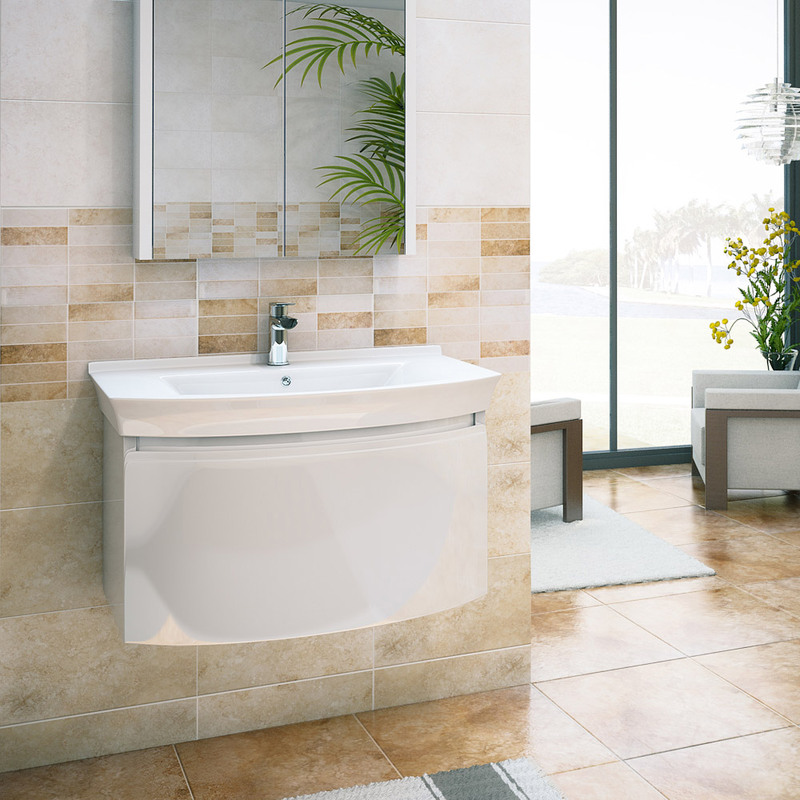 Victorian Plumbing have a Pinterest account which is full of bathroom ideas and inspiration. Why not check it out our bathroom tiles board and see if we can inspire you? If you’re looking for some other ways to buy tiles for your bathroom for less, why not check out a bathroom tiles sale page. You never know what you may find and you can often pick up a real bargain. We really hope you liked this week’s WYB feature and find it helpful when you’re looking for bathroom wall tiles on a budget. If you have any suggestions, feedback or questions please leave a comment in the comments section below. If you know a friend who may benefit from this feature please feel free to share it with them via email or social media.